What Vacuum Pump best fits your needs? Need help finding the right industrial pump? Across a vast range of industries, the vacuum pump is utilized for various applications, from the packaging of goods to the removal of moisture. From hospitals and commercial pressing plants to factories where automobiles and airplanes are assembled, industrial vacuum pumps make operations easier, cleaner and more sanitary. In order to serve the vast range of needs for such technology, a handful of different vacuum pump types have been developed over the past century. Some are more suited for commercial manufacturing, while others are better equipped for hospitals and service industries. Whatever demands might exist within an industry, there’s no doubt a vacuum pump is capable of fulfilling each demand and offering maximum performance benefits. Industrial vacuum pumps are mechanical devices that remove gases from an enclosed space for the purpose of creating a vacuum. Industrial vacuum pumps are used for numerous applications in a wide range of industries including pharmaceutical, oil & gas, food & beverage processing, power generation and many others. There are many types of industrial vacuum pump systems. Read more about the different types below. A rotary vane industrial vacuum pump works by positive displacement, which entails the forcing of a fixed amount of gas from the pump’s inlet pressure section to its discharge. Rotary vane pumps are comprised of a series of vanes that are mounted to a rotor that turns inside a cavity. As the vanes rotate, centrifugal force extends them from their individual slots, forming compression cells. Rotary screw pumps include two parallel rotary screws in the pump housing. The screws are synchronized to turn in opposite directions, which causes the compression action to occur. 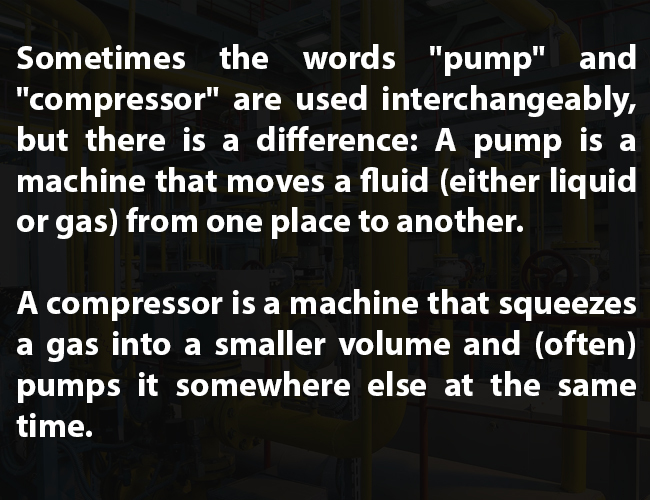 The gas is compressed in the direction of the pump’s discharge port. Pump cooling most commonly occurs via an oil lubrication circuit with an air-cooled heat exchanger. The vacuum units are frequently used in centralized systems rather than in point of use/application specific situations. Oil-free versions are also available. Claw vacuum pumps consist of two rotors that do not come in contact with one another during rotation. As the rotors turn, gas moves from the suction side to the pressure side, where the difference in pressure between the two sides causes the gas to be compressed. Cooling air is drawn into the compression housing to reduce the temperature before it exits the pump. An articulated piston industrial vacuum pump operates in a manner like that of an automobile engine. As the piston moves downward inside the cylinder, air is drawn in through the intake valve. During the piston’s upward stroke, the air is permitted to escape via an exhaust valve. Two spring-backed piston rings are used to seal the piston to the cylinder. Liquid ring pumps also operate via positive displacement. During operation, the pump’s impeller rotates inside the pump casing. A rotating liquid ring then seals the impeller and its blades. Liquid is sucked into the compression chamber to keep the ring stable. Conveyed gas is compressed during each impeller revolution. Each pump type has its advantages and disadvantages, which will have an impact on which pump you choose. For instance, liquid ring pumps have a large capacity range, but they also come with high operating and maintenance costs. Screw pumps also offer a high-volume capability. However, they are more sensitive to contaminants. Contact John Henry Foster to learn more about industrial pump vacuum systems and how to choose the best pump for your applications.